HP Regal TouchSmart 15″ Laptop – Features an Intel Core i3-3110M Processor and 500 GB SATA hard drive. The touch screen is something you’ll love! Just $498! HP Photosmart 7520 All-in-One-Printer – Print, scan, copy, fax, and web enabled. Now, you can print from your devices wirelessly. Print up to 34 ppm and in high print resolution up to 9600 x 2400 dpi. Now, you can print your photos right from your device or memory card without using your computer. Just $149.99! 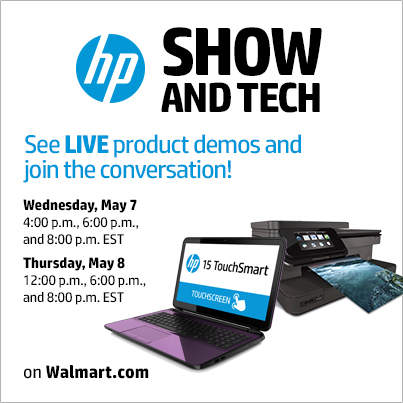 The demos are live today, Thursday May 8th, online at Walmart.com. Join in one of the live demos happening at 12:00pm, 6:00pm, and 8:00pm EST. (9am, 3pm, and 5pm PST).